Joan Santopinto and Vreni Gurd have combined their fitness knowledge and talent to produce a how-to guide to stay strong and flexible for men and women over 40 years old. Joan and Vreni have proven expertise in the fitness industry; both having degrees in physical education and having completed courses at the CHEK (Corrective Holistic Exercise Kinesiology) Institute. Joan and Vreni know firsthand how exercising on a regular basis is the elixir of youth, with their years of experience training middle-aged and older clients. Watching their clients, some over 80 and 90 years old, provides a powerful inspiration for what is possible. For instance, Joan is currently working with a gentleman over 90 years old who is still practicing headstands and his overall fitness level is absolutely astounding. Joan and Vreni currently live and work in Vancouver. In the 80’s Joan owned the popular gym Heaven’s Fitness where she taught classes for years. Heaven’s Fitness had a great reputation across Western Canada well known for their aerobics classes. Vreni taught fitness in Toronto for ten years before moving back to Vancouver. She has also taught corrective-exercise seminars and workshops on the shoulder and the core to other personal trainers. The goal of the DVD is to address common postural and movement issues that boomers may experience, while providing an excellent strength and conditioning work out. By targeting the boomer generation, Joan and Vreni have created a specific workout DVD, unlike anything else on the market geared to those over 40, to regain their range-of-motion and functional abilities like getting up and down off the floor easily. Throughout the DVD, the two demonstrate and explain correct exercise technique as well as point out common mistakes to help their audience get the most out of the workout. By doing the exercises correctly, participants will improve strength and flexibility as well as posture and functional ability. By incorporating key foundational exercises, step-by-step instructions, and three difficulty levels, The Anti-Aging Exercise Solution is suitable for all. ‘Rejuvenate, Regenerate and Energize’ your body with Joan Santopinto and Vreni Gurd. Follow their structured workouts on The Anti-Aging Exercise Solution DVD and improve your physical health. 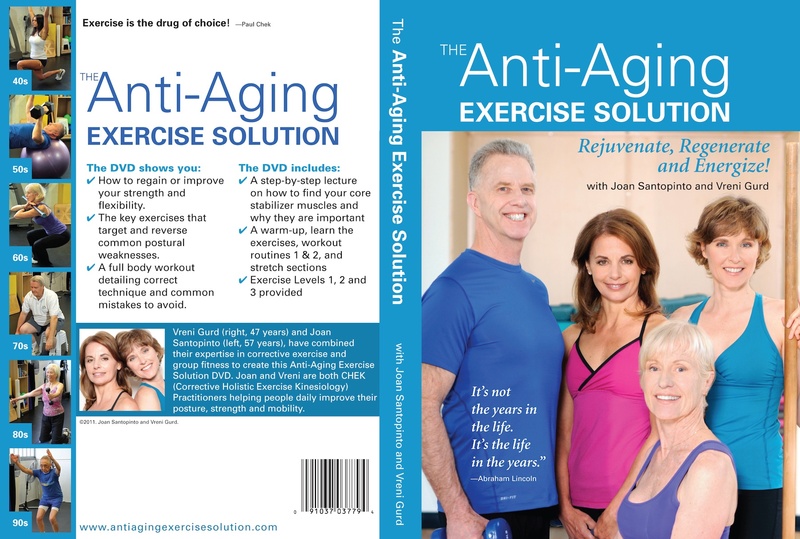 This entry was posted in The Anti-Aging Exercise Solution and tagged CHEK, exercise, Joan Santopinto, Lesley Diana, personal training, The Anti-Aging Exercise Program, The Promotion People, Vreni Gurd on October 4, 2012 by press.